When Cecilia Gimenez, a woman in her eighties, took her paintbrushes to a 19th-century fresco of Christ in a church in the Spanish town of Borja, she thought there were parts of the picture that needed repainting. So she started retouching the original herself, bringing great enthusiasm and dedication to the task, utterly convinced her work would improve it. Unfortunately, she had no idea what she was doing. By the time she had finished, she had wrecked the picture. Professional restorers do not, of course, make the kind of crass and catastrophic blunders that Cecilia Gimenez made. But if their interventions do not actually destroy far more important works of art than Martinez’s fresco, there is a growing consensus that they do not always improve them – and on occasion, they may seriously damage them. Take a look, for example, at what the National Gallery did to Paolo Uccello’s painting, The Battle of San Romano, which was radically cleaned in the Sixties. The colours look faded, almost bleached out, and the figures and horses strangely flat. Techniques of restoration are an immensely delicate and controversial topic: the procedures that one generation of restorers swear by, and insist constitute the final answer to how to restore paintings, are frequently repudiated in equally emphatic terms by their successors. The funniest story of 2012 was the Spanish lady who touched up an original painting of Jesus and totally changed its appearance. The above comments relate to original artworks. Obviously such art comes from an era several centuries before vintage bicycles. But vintage bicycle enthusiasts treat their subject with the same reverence as religious paintings – we ‘worship’ bicycles that are rare, of interesting design, and in remarkable original condition. Vintage vehicle magazines are to blame for the unnecessary restoration of original classics. Their advertisers – who sell products to assist restoration: paint, polish, repro parts – are the magazines’ prime source of income. So their magazine articles primarily feature restored vehicles. In the 1990s there was a grassroots rebellion in the hot rod and custom hobby, with enthusiasts eschewing high-cost Californian hot rods in favour of low-buck period rods in primer. This attitude spread to the Splitscreen VW hobby: so much so that, by the 21st century, nearly every splitty in Great Britain had a uniform ‘patinised’ appearance. How does this affect the vintage bicycle hobby? In America, a different grassroots rebellion occurred: the objection being to the pedantry of the vintage hobby’s insistence on every item on a bicycle being 100% accurate to how it looked when it was new. The problem was that original bicycle parts became rarer, increased in value, and selling them became an industry. 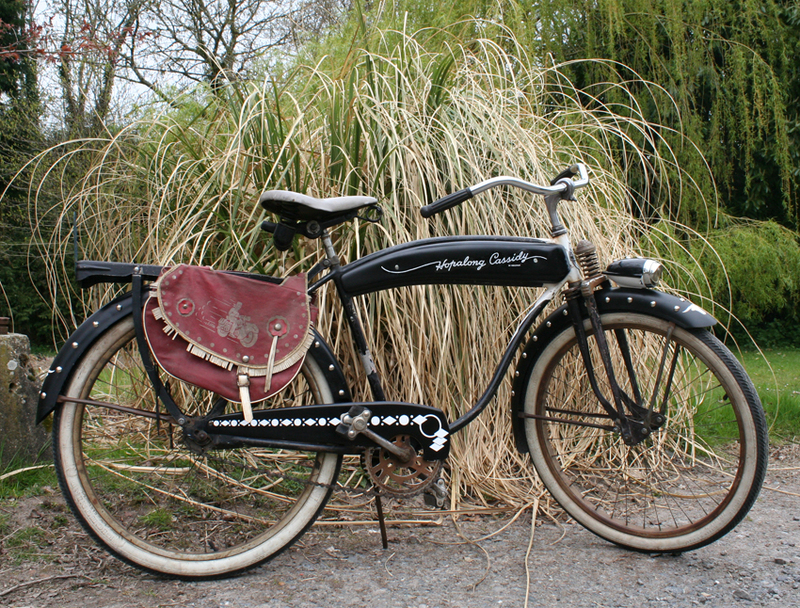 This resulted in the ‘rat rod’ style, where bicycles are customised with newer parts or components are added from other manufacturer’s bikes. It’s a creative movement where ascetic qualities are valued over originality. In Great Britain, the rebellion is different. It started with the vintage motorcycle hobby, again with the magazines encouraging every owner to totally restore their classic motorcycle …and giving the impression that an unrestored original vintage motorcycle was only ever a project waiting to be repainted. The grassroots rebellion took the shape of ‘oily rag’ motorcycles, ie scruffy machines in running order but not repainted. You don’t polish your bike, just wipe it over with an oily rag. 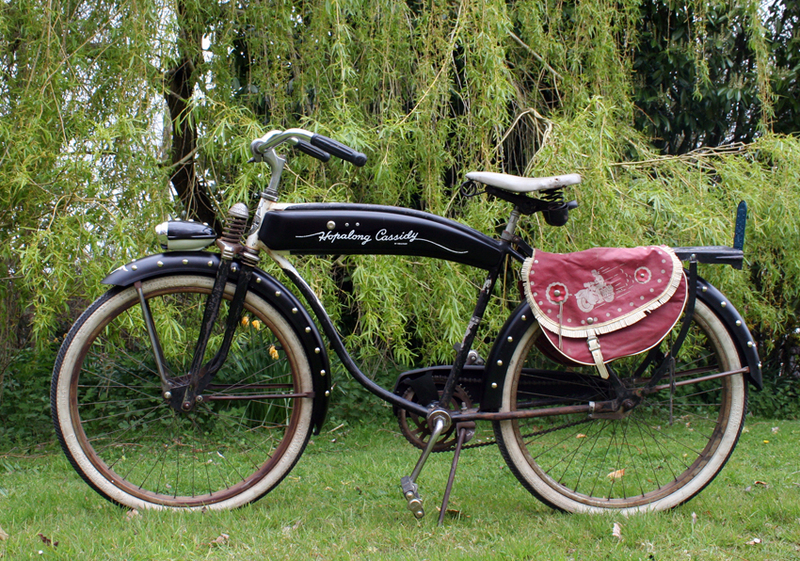 Although the vintage bicycle hobby does not have a magazine industry to brainwash it, many enthusiasts simply assume that unrestored bicycles must be repainted. So, in recent years, the ‘Oily Rag Club’ has spread to the bicycle hobby too. While novices assume a ‘barn find’ bike is worth less because it must be restored, experienced collectors treasure unrestored bicycles with original paintwork. This Hopalong Cassidy ‘restoration’ will disappoint a lot of Americans. Why? Becuase when you look at the photo above it appears that the bicycle has been totally repainted and rechromed, ie everything redone to make it look like new. So many of these bicycles have been repainted by over-zealous ‘restorers’ that there are not many original examples left. After much searching, I was lucky enough to find an unrestored frame, still displaying its original decals. Luckily, Rollfast Hopalong Cassidy bicycles are such fabulous machines that whatever condition they are in they can not help but impress. Bas burnt the midnight oil and got the Hoppy finished just in time for the Amberley Show. It was very well-received, and I took it for a spin around the parade ground. Always a joy, the first ride after restoring a pile of bits.